Clearly, pink isn’t Renault Formula One driver Nico Hülkenberg’s favorite color, which I can empathize with. Either way, I’m not sure anyone who’s stuck wearing Renault’s odd yellow-pants race suits for the year can really say much about another team’s livery. Seriously, man, what are those? But he did! Shots fired. 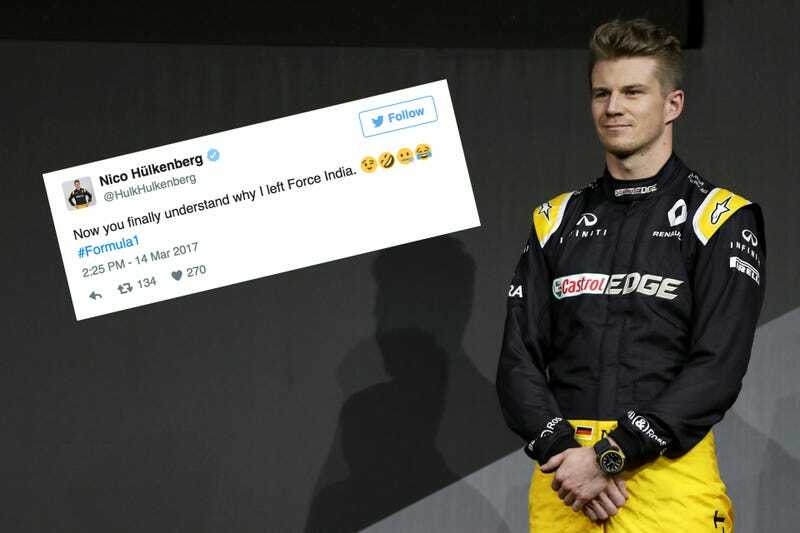 Here and we thought Hülk made the move because Renault was pouring money into things like hiring away 2015 Le Mans winner Hülkenberg from Force India and building its first all-new car since 2012. Goodness knows, it wasn’t Renault’s performance last year, where they got soundly beaten by Force India in the constructors’ championship—not to mention by perpetually troubled McLaren, Red Bull’s b-team Toro Rosso and newcomers to the sport Haas, among several others. Regardless, don’t slam the use of color. Pink is fine, and I think it’s time we moved on from the squeamishness around it as a lesser or “girly” color. I got so tired of having “50 Shades of Grey” be an adequate description of the grid last year, so don’t mess this up! 2017's grid is a rainbow of easy-to-spot wonderfulness and I wouldn’t have it any other way. I mean, who can hate on Hello Kitty?